What’s the best cordless chainsaw? We cover everything you need to know and more about choosing the right cordless chainsaw for your needs. We recommend many excellent chainsaws that we feel are worth your money. Cordless chainsaws, or more specifically – battery powered electric chainsaws, are among the most commonly used power tools in existence. Cordless chainsaws are lighter than their gas-powered counterparts, and are also much easier to handle, making them the perfect choice for casual users or homeowners. The bigger and heavier gas chainsaws (18” bar length and above), are designed to take down trees, chopping down trunks into logs, etc. On the other hand, cordless chainsaws are designed for lighter tasks such as pruning, limbing, or cutting small pieces of firewood. The focus of this article will be on cordless chainsaws only, hence we are not going to discuss about corded or gas-powered models. We will however, provide you with a comparison between cordless and corded electric chainsaws so that you can gain a better understanding of why one is preferred over the other. We shall also discuss how a battery powered chainsaw works, and educate you on the distinct types of batteries as well as the importance of selecting the correct battery for your cordless chainsaw. While it is true that cordless chainsaws and electric chainsaws in general, are preferred to carry out small – medium sized tasks, there are a few cordless chainsaws that can rival larger/ heavier gasoline chainsaws when it comes to cutting speed and overall power. We have included reviews for some of the most popular cordless chainsaw models available in the market. These reviews will help you choose the perfect cordless chainsaw for yourself, and will also give you an idea of the features that you can expect to find in a good cordless chainsaw in a specific price range. The key point to remember while browsing these reviews is that there is no single “best cordless chainsaw” out there for you to buy. If that were the case, more than half the chainsaw manufacturers would be out of business, and we could wrap up the entire article with a review of that single almighty chainsaw. Every chainsaw caters to a specific group of potential buyers, based on its size and features. Different chainsaw models have unique strengths and weaknesses, which we have made sure to highlight so that you can choose the one which confirms to your specific needs. Powerful, great features, well-made and very affordable. Lightweight yet extremely powerful, the Earthwise LCS35814 is a brilliant choice for anyone who is interested in cutting some firewood. It is designed to be compact, swift, and easy to use. The housing is made from high quality plastic which allows this cordless chainsaw to stay light without compromising on structural integrity. You can use it in and around your home, but if needed, the LCS35814 is more than ready to handle heavily wooded areas such as forests. It can withstand a fair bit of wear and tear, and since it is an electric chainsaw, maintenance is going to be the least of your concerns while operating this machine. 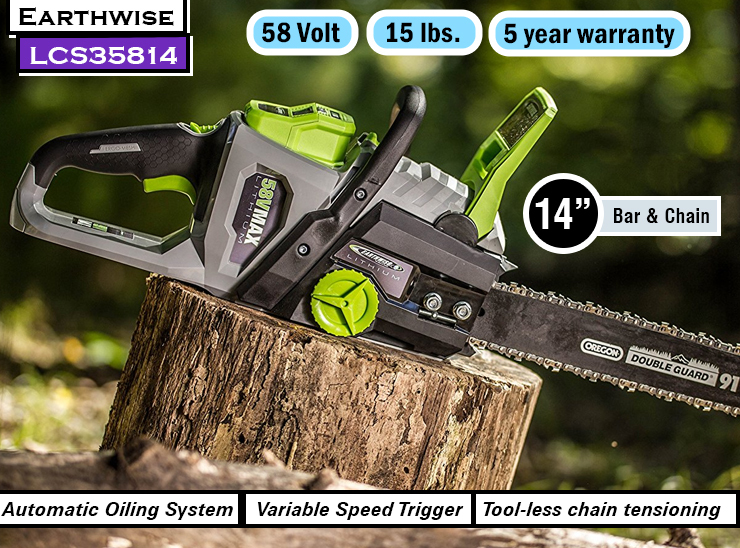 Equipped with a 14” bar and chain, the Earthwise LCS35814 is capable of consistently cutting through 12” thick tree trunks and logs, although it can struggle a fair bit with wood that is 14” deep or more. The bar and chain are manufactured by Oregon, one of the most reputable bar/ chain providers in the entire chainsaw industry. The LCS35814 is equipped with a special low-kickback chain that significantly reduces the chances of kickback, ensuring greater safety for the operator at all times. Moving on to the things that make this chainsaw really special – it is one of the few chainsaws that is extremely easy to maintain and handle despite being one of the most powerful cordless models out there. The reason behind its power is the combination of a brushless motor and 58V Lithium Ion battery. The 58V battery allows this chainsaw to slice through fallen trees and firewood with ease, while the brushless motor ensures maximum efficiency and longer lifetimes. One more advantage of using a brushless motor is decreased noise output – even in the electric category, the LCS35814 is considered to be one of the quieter chainsaws. For the price, this is one of the best cordless chainsaws that you can buy. It features tool-less chain tensioning and has an automatic oiler built into the bar assembly that keeps the bar and chain lubricated whenever you cut wood. All you need to do is ensure that the chain oil is filled to an appropriate level before you start the saw. Oh, and you also have to recharge the battery. But that’s it – do those two tasks and the LCS35814 will take care of the rest. Charging the battery takes nearly two hours when it is fully depleted, and run-etimes can vary between 30 minutes to 45 minutes based on the type/ thickness of wood that you are cutting. The chain oil compartment and cap are located in a convenient position, right next to the front handle. The rear handle is fitted with an Ergo Mesh grip which enhances control and makes sure that your hands don’t feel strained or cramped after a hour or two of cutting wood. Overall ergonomics and weight balancing is pretty good, verified customers have reported that they can comfortable use the LCS35814 for extended periods of time. Solid construction at an affordable price. A timeless classic chainsaw. From one of the biggest names in the chainsaw industry, comes a rather small cordless chainsaw. But wait – don’t be fooled by its size. The BLACK + DECKER LCS1240 is deceptively powerful for a 12” battery powered chainsaw. And it is immensely fun to use, whether you are working on a home improvement project, pruning trees in your lawn, or cutting away branches from a giant firewood tree that you felled with your professional-grade 21” gas chainsaw. The LCS1240 is fitted with a 12” low-kickback Oregon bar and chain, along with a guide bar scabbard that protects the chain whenever it is not in use. Powered by a 40V lithium ion battery, the LCS1240’s chain runs at a speed of 5 meters/ s, allowing this chainsaw to cut through 4 x 4 pine lumber nearly 13% faster than one of its primary competitors, the Ryobi RY40500 (also a 40V cordless 12” chainsaw). The BLACK + DECKER LCS1240 doesn’t just cut fast, it is also very easy to maintain. Thanks to the automatic oiler and tool-less chain tensioning, you can forget about manually lubricating or tightening the saw chain. Two concentric dials are located on top of the bar nut, rotate the inner dial to loosen the bar, and turn the outer dial to tension the chain. The oil cap is located right next to the foregrip, and there is a transparent oil level indicator window which lets you keep a tab on saw chain oil levels while working/ before starting the saw. The 40V MAX 2.0 Ah lithium ion battery included with this chainsaw allows you to make over 60 cuts (on average) in 4 x 4 pine lumber per charge. While the LCS1240’s primary job is to cut small pieces of firewood and chop down small tree limbs, it can be used to fell trees with trunks up to 8 or 9 inches in thickness. The LCS1240 can cut through pine and oak, even redwood and spruce if you keep the chain sharp and well maintained at all times. But don’t try to cut logs or trunks thicker than 10”, because that’s when the little electric motor in this chainsaw begins to show its limits. Pushing it too far could overload the circuit and cause a burnout in the motor coils. The battery has an LED indicator bar that shows you how much charge is left, very handy to know if you are out in the woods cutting firewood (we recommend getting an extra battery for outdoor cutting). Features Husqvarna’s TrioBrake, an innovative way of stopping the chain rapidly. It is a Husqvarna, so we probably don’t have to talk about how well built and reliable this chainsaw is. Anyone who has done their research on chainsaws knows that Husqvarna is one of the few companies that keeps pumping out quality products year after year, no exceptions made at any price range. Still, why should you buy the 120i? What makes this Husqvarna battery powered chainsaw different from any other similarly sized cordless model? Well, let us start with the basics. The Husqvarna 120i is one of the fastest 14” cordless models out there, with a maximum chain speed of nearly 11.5 meters per second. It is capable of slicing through hardwoods like oak, pine, ash, redwood, etc. with relative ease when compared to other 14” cordless chainsaws in the market. It is however slightly louder than most 14” cordless chainsaws of this size, producing nearly 97dB(A) of sound (measured at operating distance). Engineered with an inertia Activated Chain Brake. Well, we know that the Husqvarna 120i can cut really well. But that’s not all – it is also extremely easy to maintain, thanks to the uniquely designed flip-up oil cap and toolless chain tensioning system. The flip-up oil cap is an excellent feature, it is so simple, yet very helpful. You don’t have to unscrew and put away the cap, all you do is push in the cap head and it pops out by itself, remaining attached to the hinge. As soon as you are done refilling the bar oil, flip it back into the closed position. This is especially useful in outdoor scenarios where you are cutting a large amount of wood, and every second of downtime avoided is crucial to increasing overall efficiency. Although the 120i is labelled as a “casual” chainsaw by Husqvarna, it is more than capable of cutting down small trees with trunks as thick as 9 to 10”. One of the major assets of this chainsaw is its attention to safety – equipped with a low kickback chain and an inertial chain brake, the chances that you will get hurt by this saw is very low. But as usual, there are no exceptions when it comes to chainsaw safety, and we recommend that you read through the safety and maintenance section at the end of this article to learn more about operating your chainsaw in a safe and reliable manner. The Husqvarna 120i is also one of the lightest 14” cordless chainsaws in existence, at just 10.8 pounds with bar and chain attached. It uses a 36.5 V lithium ion battery, and features a special savE mode that trims down on energy consumption and noise levels by running the motor at a lower speed. This mode is very useful when you are cutting firewood or pruning trees in an urban area, or in the morning when people are still asleep. It also increases battery life, but at the cost of power output. Use it only for light tasks. Time needed to charge the 36V 4.0 Ah battery is 100 – 140 minutes. Excellent lightweight chainsaw for homeowners. Cheap, lightweight, and fun to use – the WORX WG322 is an amazing cordless chainsaw for home improvement/ DIY projects, and general lawn maintenance tasks. It features a tool – free chain tensioning system which allows you to adjust chain tension in the middle of work by just rotating a dial. No need to meddle with nuts and bolts, no need to carry tools with you – just release the trigger which will cause the motor to automatically shut down, activate the chain brake, and proceed to turn the large black dial that is conveniently located right next to where the bar meets the chainsaw. You will also notice that the WORX WG322 is very compact and ergonomic, making it a brilliant choice for both young users and senior citizens. There is a battery charge level indicator, and the whole unit weighs just 6.2 pounds. It uses a 10” bar and chain, both of which are optimized for low kickback. The 20V lithium ion battery provides sufficient energy to the motor for it to spin the 40-link chain at a speed of 3.81 meter/ s. It is not much, but then you don’t really expect to be felling trees with a cordless 10” chainsaw, do you? The WORX WG322 is perfect for light tasks such as pruning, DIY projects, limbing, etc. You can use it to cut small pieces of firewood, but the battery won’t last very long with tasks like that. In that case, you might want to purchase a second 20V lithium ion battery for this chainsaw, if you wish to cut firewood with it. Remember – the 20V battery that comes with this chainsaw needs 5 hours to go from zero to full charge, so if you plan to do anything other than pruning or home improvement stuff, you better have a second battery charged and ready. A charger is included along with the chainsaw, and we searched for any sort of quick charge accessory that might be available for this particular model, but found none. It requires an extremely long amount of time to charge the 20V battery on this model, unlike most other cordless chainsaws we have reviewed until now. But then again, it is one of the cheapest cordless chainsaws on the market and barely weighs 6 pounds with the 10” bar and chain attached. It is clearly not intended for usage in deep forests, as you can tell by the 3.81 meter/ s chain speed. Ideal for tree trimming, pruning, & firewood. The automatic oiler and toolless chain tensioning is really good to have on such an affordable model, and the overall ergonomics are pretty good. All things considered, a great little battery powered option for people who need a compact, quiet, and maintenance free cordless chainsaw for cutting and pruning tress in their yard, or for miscellaneous DIY projects. Dewalt quality is best in class. Excellent buy. DEWALT has designed this chainsaw specifically for people who wish to prune trees, do DIY projects, and occasionally cut firewood, but don’t want to go through the hassle of owning a gas chainsaw. It is powered by a 20V lithium ion battery just like the Worx WG322, but this battery delivers 5Ah of charge which results in a chain speed of nearly 7.68 meters/ s compared to the mere 3.81 meter/ s chain speed of the WG322. Also, the DCCS620P1 features a 12” Oregon bar and chain which allows it to make larger cuts than the Worx WG322. 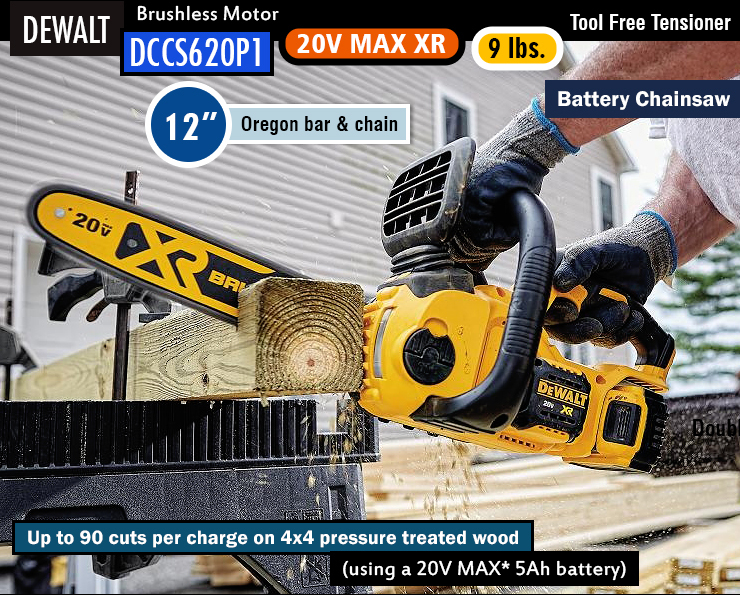 A more powerful brushless motor than the WG322 enables the DEWALT DCCS620P1 to cut through medium to large-sized chunks of firewood, tree limbs as thick as 8 – 9 inches, and much more. DEWALT claims that the DCCS620P1 is suited for outdoor applications, such as cutting firewood in forests, or even construction work. It does require a different kind of chain to be used in construction work, but the motor on this chainsaw is definitely not weak by any means. If anything, this might be the most powerful 20V cordless chainsaw in the market, thanks to the high discharge lithium ion battery and advanced brushless motor. The motor in the DCCS620P1 generates 0.2 Nm of torque, and the chain used is a 0.043-gauge low kickback Oregon chain with 45 links. Toolless chain tensioning and automatic oiling greatly help decrease maintenance work, while the compact yet sturdy design enables you to exert yourself without worrying about damaging the saw. Use it to cut beams, do demolition work, and manage tree limbs. It uses the DEWALT DCB205 20V 5Ah battery, and weighs about 8.8 pounds with bar and chain attached. The DEWALT DCCS620P1 is actually a kit that includes the battery and charging kit along with the chainsaw. If you want just the chainsaw, without battery or charger, then you might want to check out the DEWALT model DCCS620B. There are some things in particular that stand out and are worth mentioning – if you purchase the whole kit, i.e. 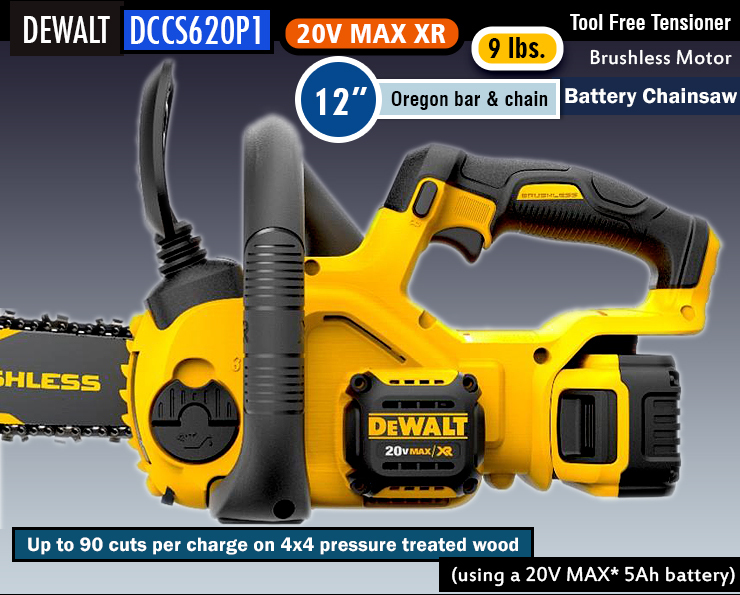 the DCCS620P1 which contains a battery and charger along with the DCCS620B chainsaw, you will find that the included charger has a special hot/ cold delay charging function. It is a really cool feature actually, the charger can sense when the battery is too hot or too cold, and will not begin charging until the battery reaches a certain temperature range. This feature is very useful in both hot and cold weather, and can come in handy when you have been using the saw for a long time and immediately pop out the battery and put it into the charger. If you have been cutting large logs or hardwood, the battery will probably be quite hot and therefore the charger will not charge it to prevent risk of damage or explosions. The same happens when you have left your chainsaw out in freezing weather and realize that the battery is too low, the charger will not charge it if it is freezing. One more safety measure is the EPS (Electronic Protection System). It is designed to protect the battery or motor from overheating, overloading, etc. The system will automatically shut down the chainsaw in case of extreme loads. Add to that the inertial chain brake, and you got yourself a light, sturdy, and extremely reliable 12” cordless chainsaw that can be used for post-storm cleanup tasks, cutting firewood, limbing, pruning, and DIY projects. Low noise level at only 89 dB(A) and zero emissions. Makita has come up with a rather unique design for a cordless chainsaw, one that uses a dual 18V LXT lithium ion battery pack instead of a single 36V battery. They made this cordless chainsaw to target a very specific section of the market. People who already own a 18V Makita power tool or 18V charging kits/ LXT batteries will be extremely pleased with the XCU02Z. For clarification, the XCU02Z model no. refers to the bare tool itself, i.e. the actual chainsaw. This does not include the two 18V LXT lithium ion batteries, nor does it include the charging kit. There is a 3-year warranty on the XCU02Z chainsaw, and you can either purchase the batteries and charger separately, or you can purchase them along with the chainsaw (for people who don’t already own a 18V power tool that uses LXT batteries). This chainsaw is not compatible with any 18V lithium ion battery, only genuine Makita LXT 18V lithium ion batteries with the star symbol on them. The XCU02Z 12” chainsaw is built to be compact and powerful, the handle is on the top of the housing, hence this is considered to be a top-handled chainsaw. We won’t discuss too much about the differences between top – handled and rear – handled chainsaws, since it is not the main purpose of the article. If you wish to learn more about that topic, you can check out our comprehensive chainsaw guide. Basically, a top – handled chainsaw delivers the same amount of cutting power as a rear – handled chainsaw, but is shorter because the operating handle is moved from the rear to the top. The foregrip is positioned to the side, and so is the inertial chain brake. Top handle chainsaws are primarily used by arborists/ linemen who climb trees and poles. The XCU02Z cordless chainsaw features a LED charge indicator built right into the body of the chainsaw, these show the respective charge levels for each of the 2 18V LXT lithium ion batteries. The 18V LXT batteries contains microchips, which provide protection from over discharge, overloading, and overheating. Equipped with Star Protection Computer Controls, the Rapid Optimum Charger (sold separately) uses the data provided by the microchips within the battery to charge them at the most optimum rate. The charger can control current, voltage, and temperature (thanks to built-in cooling fans), so that you spend less time charging the batteries, and more time cutting wood. Extreme Protection Technology (XPT) for improved dust and water resistance. The 12” guide bar and chain are designed for low kickback, and there is an automatic oiling system, Chain oil levels can be monitored while working, thanks to the view window. The XCU02Z also features Makita’s very own XPT (Extreme Protection Technology) which prevents dust and moisture from getting into the internals. The increased dust and water resistance makes this chainsaw an optimal choice for jobsites and thickly wooded areas. There is thick rubber padding on the grips to reduce user fatigue, and the entire unit weighs just 10.1 pounds with batteries attached. It is also one of the least noisy cordless models, generating just 89 dB(A) of sound at operating distance. Onboard chain sharpening tool makes this a standout chainsaw. The only cordless chainsaw on the entire market to be equipped with PowerSharp, a revolutionary self – sharpening system which lets you sharpen the chain while working, on the field. No need to take out the bar and chain, set up a platform, or meddle with files and other sharpening tools. All you need to do is engage the red sharpening lever located right on top of the toolless chain tensioning dial, and then press the throttle. This will run the chain on top of a special designed grindstone which is concealed underneath the bar cover, sharpening the .050-gauge low profile Oregon chain within a matter of seconds. Not only does this save you from the tedium of having to take apart the entire bar and chain system and manually doing the job, but it also ensures that each saw tooth is sharpened evenly. This will guarantee that your cuts are even, and the chainsaw won’t run off towards a particular direction while cutting through a log of wood, something that happens when inexperienced users manually sharpen the saw chain and forget to double check each link to make sure that all cutters are evenly sharpened. But that’s not all the good stuff, the CS300 is also the most powerful cordless chainsaw ever built by Oregon. It is powered by a high torque brushless motor which makes less noise and wastes less energy, resulting in 40% more power and torque than its famous predecessor, the Oregon CS250 cordless chainsaw. Powered by a 40V 2.0 Ah MAX lithium ion battery, the Oregon CS300 is more than ready to take on tasks such as felling, bucking, and buttress root removal. The saw weighs 12 pounds with battery and 16” bar + chain attached, and is ergonomically designed to provide a great user experience. The weight is evenly distributed, and the handles are well padded with cushioning materials. The wrap around handlebar is strengthened with a metal tube, and steel bucking spikes adorn the front of this chainsaw. In terms of safety features, there is an inertial chain brake on the front, along with an electric brake which you can activate from the rear console. There is an oil level window on the rear, and the large red oil cap is in a convenient to access position. The Oregon GCS80420 can cut through an 8” pine log in about 9.94 seconds, and can make 47 such cuts with a fully charged 40V 4.0Ah battery (the one that comes in the default configuration). You can choose to go with a 2.0 Ah for lighter tasks, at the expense of decreased runtime. 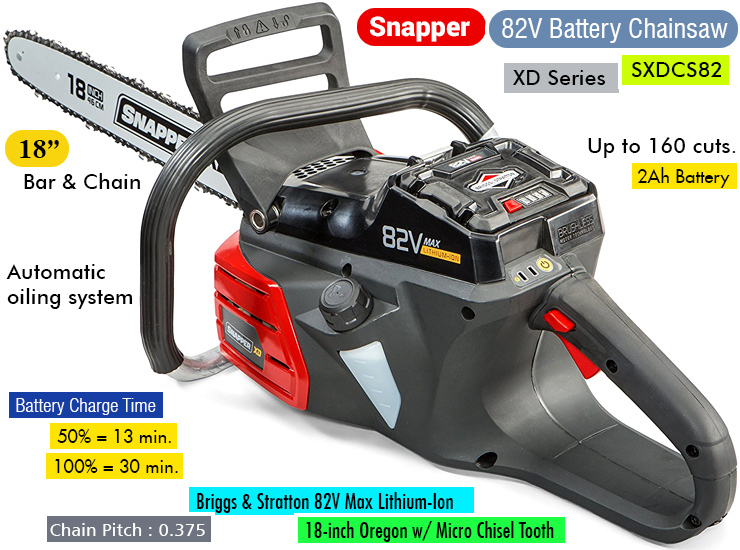 Or, you can buy the most expensive battery for this saw – a 40V 6.0 Ah pack which allows you to fell and buck small trees for an hour or more continuously before you have to recharge the battery. The battery needs 4 hours to fully recharge, which is a bit of a concern. Especially when you consider the GreenWorks Pro GCS80420 18” chainsaw that has an 80V battery which can recharge in just 30 minutes. And the GreenWorks Pro GCS80420 is also more powerful, capable of making larger cuts. But it is not as light and easy to handle as the Oregon CS300, and the automatic chain sharpening system of the CS300 is a huge bonus that no other competitor on the market has right now. Features auto-oiling for continuous lubrication. The DEWALT DCCS670X1 uses a FLEXVOLT 60V battery, while the DCCS690H1 uses a 40V 6 Ah (ampere hour) battery. To someone who doesn’t really know much about battery platforms, it may seem that the higher voltage signifies more power output. But that is not true in this case – the DEWALT DCCS690H1 is actually the more powerful chainsaw, despite using a 40V MAX lithium ion battery. Now, the key difference between these two chainsaws revolves around the batteries that they use. 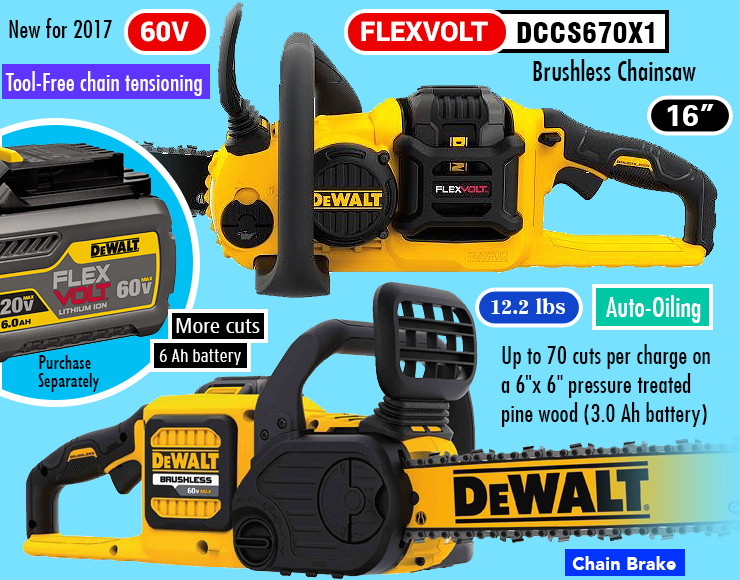 The DCCS670X1 package consists of the DCCS670 16” cordless chainsaw, a 60V FLEXVOLT battery, and a charger. The DCCS690H1 package consists of the DCCS690 16” cordless chainsaw, a 40V MAX lithium ion battery, and a charger. The DCCS670 and DCCS690 make up the core of each package – they are very similar 16” cordless chainsaws manufactured by DEWALT, and they both use similar mechanisms and have the exact same features. However, one uses a 60V FLEXVOLT™ battery, while the other uses a 40V MAX battery. We know this is getting a little confusing, but stay with us for a moment – the FLEXVOLT battery system was developed by DEWALT with the goal of creating a singular battery platform to use across their entire family of cordless power tools such as hedgers, trimmers, blowers, and lawn mowers. The cool thing about the 60V FLEXVOLT lithium ion battery is that it is backward compatible with 20V DEWALT power tools. You can also combine two of them to run 120V cordless DEWALT power tools such as the FLEXVOLT miter saw. Basically, the battery is called a FLEXVOLT battery because it supports multiple voltages, making it “flexible voltage”. There are three different voltages that this battery can output – 20, 60, and 120 (when you combine two 60V). How it does so is a rather complicated topic, and we suggest that you check out our article on the DEWALT FLEXVOLT system to learn more. Moving on, why is the DCCS690H1 is a more powerful chainsaw despite using a 40V battery? Well, its battery has a higher capacity, which basically means it can deliver more charge per unit time. The 60V FLEXVOLT is a 3 Ah battery, while the 40V MAX battery is a 6 Ah model that delivers more power to the motor. Of course, the motor won’t be drawing 6 amps all the time, but the theory is that if it wanted to, it can do so for up to one hour. Variable speed trigger for user control. You will find that the DCCS670X1 is more than enough for handling light cutting tasks, while the slightly heavier DCCS690H1 is more suited to bucking, felling, etc. The DCCS670 and DCCS690 are equipped with toolless chain tensioning and automatic oiler systems. They both run Oregon 16” bars and chains, optimized for low kickback. Both chainsaws also feature LubriLink and LubriWell for superior oil transfer across each chain link and every section of the rail on which the chain rides. Excellent chainsaw for yard work. The WEN 40417 is a 16” cordless chainsaw with all the good things you would expect from one of the best chainsaw manufacturers in the market. It has all the standard safety stuff – inertial chain brake, safety switch, throttle lock, chain guard, etc. The WEN 40417 is also powered by a brushless DC motor, much like any other premium cordless chainsaw. This motor in particular, is designed to take advantage of the powerful 40V 4.0 Ah lithium ion battery. Not only is the MAX lithium ion battery really high capacity, but it is also fade-free. Which basically means that the power output of the motor will not decrease whenever the battery gets low on charge. This used to be an issue with previous generations of cordless power tools, especially the ones that used NiCad batteries. Included along with the chainsaw itself, are the following three items – a 40V 4Ah MAX lithium ion battery, charger, and a scabbard to protect the chain/ bar from damage during storage or transportation. Toolless chain tensioning allows for quick and effortless adjustment of chain tension, while the see-through oil level indicator makes it easy for the user to know when an oil refill is due. Despite being one of the more powerful 16” cordless chainsaws, the WEN 40417 weighs only 12 pounds with the battery attached. Maximum torque is very impressive as well – 1.7 Nm. Combine that with the maximum chain speed of up to 49 feet/ s, and you’ve got yourselves a worthy alternative to a 45cc gas chainsaw. Based on customer reports and testing, the WEN 40417 is about 80-85% as powerful as a gas chainsaw of comparable size and weight (most of them in the 38 – 45cc range). But the slight loss in raw cutting power is more than made up for by the excellent design and maintenance free nature of this chainsaw. No need to pull starter cords every time you lift up the chainsaw, no need to mix gas an oil, no more loud noises and stinking gasoline exhaust in your face. All you have to do with this chainsaw is recharge the battery and refill the chain oil. It is quiet, emission-free, and requires almost zero maintenance. On top of that, the ergonomics and handling are excellent. Grips are coated with rubber padding, and the metal chassis feels sturdy enough for heavy tasks such as felling or bucking. Backed by a 4-year warranty (2-year battery and charger warranty). One of the most affordable 14” cordless chainsaws on the market, the Poulan Pro 967044101 chainsaw is a splendid example of great power in small packages. It is powered by a 40V 2Ah lithium ion battery which provides the brushless motor with the energy that it needs for cutting through limbs and tree trunks up to 6” in diameter. It can be used for cutting 4 x 4s and 6 x 6s on construction sites, or as a trimming and pruning tool for your garden. The 14” guide bar features a small-radius nose for low kickback, and is made from durable yet lightweight metal alloy. The 14” low kickback chain is optimized for smooth cutting and is heat treated for maximum toughness. Chrome plated cutters slice effortlessly through hardwoods such as oak, ash, redwood, maple, and pine. The Poulan Pro 967044101 doesn’t come with a toolless chain tensioning system, which is slightly disappointing given the fact that most other chainsaws in this price range feature toolless chain tensioning. But that is no deal breaker, as there are many things which we love about this cordless 14” chainsaw. For example, the flip-to-open oil cap. Unlike screw-on caps, the flipping oil cap is much easier to use in the middle of a cutting session, and also ensures that you don’t accidentally lose the cap because you were preoccupied with filling the oil or checking chain tension. The oil level indicator window is also a neat little addition, and it is quite large unlike some more expensive chainsaws which feature a see-through oil window, but it is so small that you can’t know for sure if the oil is above 25% or 50%. Ergonomically designed for maximum comfort, weight and performance. The easy start feature will appeal to gas chainsaw owners who have grown tired of pulling the cord every 5 minutes just to start the saw because they placed it down after a cut. There is a throttle lock switch located right next to the throttle trigger, and you will find that an alarm sound triggers whenever the chain brake is engaged. Small features indeed, but they make a lot of difference. The Poulan Pro 967044101 also has an automatic oiling system, although you cannot adjust the amount of oil that is released into the bar and chain. Finally, the 40V lithium ion battery used in the 967044101 is compatible across the entire family of 40V cordless Poulan Pro products. Want the power of a gas chainsaw, but without all the hassle that comes with owning one? In that case, you might need one of these – the GreenWorks Pro GCS80420 80V cordless chainsaw. Its brushless electric motor and massive 80V lithium ion battery allows the GCS80420 to cut through wood with speeds comparable to a 45cc gasoline chainsaw. Perfect for cutting firewood, limbing, and even bucking small to medium sized trees, while the 18” bar and chain allows this chainsaw to comfortably slice through 10” thick tree trunks without showing the slightest sign of overloading or stalling. It has been reported by many buyers that the GreenWorks Pro GCS80420 80V cordless chainsaw is capable of bucking hardwood logs that are between 16 to 20 inches in diameter. It isn’t comparable to a professional 18” gas chainsaw, but the 80V battery and uniquely designed brushless motor allow this cordless chainsaw to accomplish feats previously unheard of in the electric chainsaw world. The best part about this chainsaw is its versatility and completely zero need for maintenance. Yes, you will need to recharge the battery after a few hours of work, since this is a cordless chainsaw after all. It will please you to know that recharging the battery from full to zero only takes 30 minutes, so you can keep working all day if you have two batteries with you. Pop one in, while the other is recharging. By the time the current one runs out of charge, the other one will have finished recharging. Swap them back and forth, and you could theoretically do this all day. Something like this is not possible with most cordless chainsaws, since they use smaller and less advanced battery packs which run out sooner and need 1-2 hours in order to charge up. The GCS80420 is equipped with a metal wraparound handle, steel bucking spikes, and an electric chain brake – all of which make it suitable for both hobbyists and professional usage. It uses the Oregon Low Profile Chamfer Chisel 91PX chain, which features ramp shaped depth gauges that help in reducing kickback (meets ANSI B.175.1 standards for low kickback). The bar is an Oregon Double Bar 91 (18”), it is lightweight and features a nose sprocket along with a small radius nose tip to reduce kickback and deliver a smoother cutting experience. Chain speed is 15 meters/ s, which is nearly twice as fast as most standard cordless chainsaws. GreenWorks claims that their 80V 2.0 Ah battery packs enough juice to make 150 cuts of 4 x 4 treated lumber. But the battery can run down quickly depending on the type of wood you are trying to cut. You should be able to fell and buck a medium sized tree with one full battery, but if you intend to cut substantial amounts of firewood or fell/ buck multiple trees on a daily basis, we highly recommend getting the 4.0 Ah battery, or two 2.0 Ah batteries so that you can charge one while the other is working. The GreenWorks Pro GCS80420 80V cordless chainsaw is one of the very few electric chainsaws that we can actually recommend for medium and heavy-duty tasks such as felling, bucking, or removal of buttress roots. This chainsaw is no longer available. Reliable, easy to start, maintenance-free, and quiet – the Snapper XD SXDCS82 has all the qualities of a good cordless chainsaw. It is powered by an 82V MAX lithium ion battery designed by Briggs & Stratton. This 82V battery is designed to be compatible across the entire family of 82V Snapper lawn maintenance tools. There are metal gripping teeth mounted on the front which dig into the bark of a tree as the 18” Oregon low kickback chain effortlessly slices through even the hardest of woods. Powered by a brushless 1200-watt motor, there is no shortage of power or torque, and you are provided with a metal wrap around handlebar to help channel all of that power into the tree that you are cutting. The Snapper XD SXDCS82 model includes just the tool, and you will have to buy the battery and charger separately. There is a 5-year warranty on the chainsaw, so you can rest assured that should anything happen to your Snapper XD SXDCS82, it will be covered by the manufacturer. Operator comfort has been put on the forefront, which is why there is a full metal handle and ample amounts of rubber cushioning which reduces fatigue and increases your grip. The Oregon 18” bar and chain are lubricated by an automatic oiler system, so all you have to do is pour in some chain oil and you are ready to start cutting. There is a blade safety lockout handle to disable the chain, along with the mandatory inertial chain brake. The chainsaw weighs just 7.6 pounds (no battery installed), and its weight is ergonomically balanced for optimal user experience. Although there is no onboard chain tension adjustment because of the heavy duty double nut bar mount, you will find that the operating handle on the rear has a little pocket cutout on the underside. This pocket contains a chain tensioning tool, so you don’t have to worry about carrying a scrench around with you at all times. The view windows allows you to monitor on chain oil levels at all times, and the 82V MAX lithium ion battery has a charge level indicator on the back, so you know when it’s time for a recharge. Thankfully, the battery (2.0 Ah version) only takes about 30 minutes to go from zero to full, and if you are using a 4 Ah battery, it will take 1 hour to recharge. Gasoline chainsaws definitely have their place, but they are being heavily contested by the continuously growing electric chainsaw industry which keeps pumping out faster, lighter, and more powerful electric chainsaws with each passing year. Electricity is the cleanest form of energy, and is extremely easy to store (in batteries) or transport (through power lines). Both corded and cordless chainsaws are powered by electrical energy, both designs have their own unique advantages and disadvantages. In this section, we shall talk about the strengths and weaknesses of corded as well as cordless chainsaws, so that you, the buyer, can gain a better understanding of why you should purchase a corded or cordless chainsaw. On the surface, it seems obvious – one has a cord attached to it, the other doesn’t. But there is more to it than just that, and these two types of electric chainsaws can vary widely in terms of prices, cutting power, size, etc. Since we have been talking exclusively about cordless chainsaws until now, let us take a small break and discuss corded chainsaws. These machines are very much like their cordless counterparts on the inside, and rely on converting electrical energy into physical force in order to drive a saw chain. However, the corded chainsaw operates on AC power, whereas a cordless chainsaw operates on DC power. AC is the current that is supplied through the power grids to your homes, it is an abbreviation for alternating current. North American homes are powered by 110V AC, most other parts of the world use 220V AC power. Which is why we don’t recommend purchasing a corded chainsaw from Europe, and plugging it into your home in the US. That could produce a lot of sparks and some magical blue fumes that you don’t want to deal with. You can however, purchase a cordless chainsaw from Europe and use it in the States without having to worry about burnouts or sparks. Irrespective of where you go in the world, a 20V 3.0 Ah battery still means a 20V 3.0 Ah battery. A cordless chainsaw is able to draw more amps of electricity because it is powered directly from the wall, and has access to a full 110 volts of electricity. The motors in a cordless chainsaw are designed to draw more current and spin faster than the motor in an average cordless chainsaw. But advancements in technology has brought the cordless chainsaw closer than ever to corded models in terms of power output, take chainsaws like the DEWALT DCCS690H1 (40V) and GreenWorks Pro GCS80420 (80V) for example. These newer cordless chainsaws are powered by high capacity lithium ion batteries which are designed to discharge massive amounts of current when the motor needs it, allowing the motor to approach the performance level of a 45cc gasoline 2-stroke engine. We shall discuss more about volts, amps, and ampere hours in a later section, but for now all you need to know is that the average corded chainsaw will have a slight power advantage on a cordless model. Not enough to make a noticeable difference in real world scenarios, but it’s there on paper. If you are a professional who cuts down large trees on a daily basis, we suggest ditching electric chainsaws altogether and going for a professional grade gasoline chainsaw. An electric motor needs energy in order to run. The motor takes electrical energy supplied to it from a power source, and then it converts that energy into rotary motion. In the case of a corded chainsaws, the power source is located away from the chainsaw. It is fed by an external power outlet in your home, hence the overall weight is reduced in comparison to a battery powered chainsaw which carries the power source onboard, in the form of a lithium ion battery pack. Depending on the capacity of your chainsaw battery, it can constitute up to half the weight of the bare chainsaw itself. Cordless chainsaw manufacturers have been trying to make lighter and higher capacity batteries for several years, and some companies like Makita, GreenWorks, and DEWALT have succeeded in developing incredibly high-capacity batteries that are smaller and lighter than previous generation batteries. This can be derived from the previous point that we made – a cordless chainsaw doesn’t use batteries. That makes it inherently cheaper than a corded chainsaw. Imagine buying a corded chainsaw without the batteries, that is how much the equivalent cordless chainsaw would cost. Corded chainsaws are also equipped with LED based consoles and battery charge indicators which add a little bit of extra overhead in terms of manufacturing costs, resulting in a higher retail price. This is possibly the biggest advantage that cordless chainsaws have over their wire-free counterparts. You can run them for as long as they are plugged into a live power outlet. No recharging needed, as long as you have paid your electricity bills. We are going to discuss about batteries and motors in the next section, so let us not go too deep into the workings of a cordless chainsaw. We know a few things about them – they are heavier and more expensive than their cordless counterparts, and their runtime is limited by the battery. But there is one major advantage that the cordless chainsaw has over the corded chainsaw, and it is portability. Think about it – which is more convenient to carry around with you, a cellphone or a giant landline telephone? Obviously the one that is not limited by wires, i.e. the cellphone. Let us talk about the advantages of a cordless chainsaw. Everyone that’s ever used a corded power tool will complain about one thing – lack of mobility. Move too far away from the power outlet, and your corded chainsaw transforms into dead weight. You can’t even dream of using corded chainsaw more than 100 feet away from the house, and people who live in ranches or go out into the woods to cut firewood can never get their heads around using a chainsaw that is powered through a cord. There is a reason ranch owners and loggers haven’t moved away from gas chainsaws completely, and power isn’t the only factor. A gas chainsaw can be used literally anywhere as long as you have gas to refuel it. In this respect, you can say that a cordless chainsaw is more similar to a gas-powered chainsaw because it too can be used anywhere as long as you have a charged battery. Easier to use and much saferCordless chainsaws are especially handy when you need to work in an area that is far away from a power outlet, or if you simply need freedom of motion. Because let’s be honest over here – the giant cord attached to the rear end of an electric chainsaw isn’t just limiting your range, it is also weighing you down since the cord itself probably weighs a couple of pounds. Not to mention, the kinds of problems that can occur when a kid or your pet dog/cat runs into one of these cords while you are working. If you were to buy an electric chainsaw for post-storm cleanup work or rescue operations, would you get a corded or cordless model? The answer is pretty simple – you will get the one that functions even when the entire power grid has been blown out, i.e. the cordless chainsaw. A cordless chainsaw is more reliable, more portable, and easier to handle despite being slightly heavier (because there isn’t a giant 60-foot long cord hanging off the back). Toolless chain tensioning – Allows you to adjust chain tension without the need for a scrench (screwdriver + wrench). Most good cordless chainsaws have this feature, since it drastically reduces downtime while working. Automatic oiler – Found on most modern chainsaws, consists of a tiny oil pump that is usually driven by the chainsaw motor and located right next to the point where the bar meets the clutch assembly. Lubricates the bar and chain to ensure that your chainsaw doesn’t stall or jam in the middle of a job, and prolongs the lifetime of the bar and chain assembly by preventing dust particles from adhering to the metal links. Oil view window – Basically a transparent section in the chainsaw housing, right on top of the oil tank. This allows you to conveniently monitor oil levels before starting the chainsaw, and while working. Brushless motor – Also known as a BLDC (Brushless DC motor), the brushless DC motor is more efficient than older DC motor designs which used commutators and brushes. It runs quieter, lasts longer, and is more efficient. High capacity battery – Any battery with an ampere-hour rating of 6 and above can be considered to be a high discharge battery, since it is capable of supplying 6 amps of current continuously to the motor for one full hour. There are batteries rated at 7.5AH and even 9AH. These are usually found on professional grade cordless chainsaws. Low kickback bar and chain – Most cordless chainsaws are equipped with low kickback chains and small radius bar noses. Low kickback chains are less aggressive and provide a smoother cut across multiple types of wood. Some cordless chainsaws such as the Oregon 40V CS300-R7 are equipped with a more aggressive chain, designed to cut slightly faster. But these aggressive chains will also get dull faster and need frequent sharpening. The Oregon Cordless 40V CS300-R7 is equipped with a self-sharpening system, which is why it can afford to run an aggressive chain. Proper safety mechanisms – These include the inertial chain brake, electric brake, throttle lock, and a sound based alarm system which notifies you whenever the brake is activated. A good metal chain catcher is also crucial, since it will catch a broken chain before it swings back into your hands or arms. Electronic Protection System – Consists of a microchip controller which detects and prevents electrical overloads or overheating in order to protect the motor and battery. Modern cordless chainsaws are loaded with advanced safety features such as electric brakes, audio based alarm systems, throttle locks, and overload protection systems. However, the biggest and most important safety feature of any chainsaw is always going to be YOU, the user. That’s right, a little bit of training and common sense goes a very long way, preventing accidents that could potentially take a limb or two from your body. The chainsaw is a magnificent cutting machine, it is compact and extremely powerful at what it does. But the saw chain cannot differentiate between wood and human flesh, and it won’t stop until the brake is applied. It is extremely important that you wear the proper Personal Protection Equipment (PPE) while operating any kind of chainsaw, be it electric or gas. Always wear a pair of protective goggles, use mufflers for your ears (even electric chainsaws are extremely loud), and invest in a nice pair of chainsaw chaps. These chaps will protect the one part of your body that is most likely to be damaged in the event of a chainsaw accident – the legs. Or more specifically, your thighs and ankles. Make sure that the chaps your purchase are thicker than ordinary, because electric motors do not stop as easily as gasoline engines, and some thinner chaps will not be able to protect your leg before the cordless chainsaw cuts into it. Ask the dealer if a pair of chaps is suitable for usage around electric chainsaws, since some chaps are specifically marked to be suitable for electric chainsaws. Always make sure that the oil tank is filled with the specific oil type that is recommended in the owner’s manual. Don’t use ordinary motor oil, chain oil is specifically designed for chainsaws and is thicker than traditional motor oil. It also contains special additives that prevent dust and sand from adhering to the chain links/ bar. Remember to use a slightly less viscous oil during the winter. Always check the chainsaw before you start it – are all the fasteners in place, and tightened properly? Is the chain sharp? Does the guide bar look cracked, bent, or fatigued? Keep the guide bar clean and remove sawdust/ dust from the spaces between the bar and chain with the help of a wire or pipe cleaner. Never perform any kind of maintenance work while the chainsaw is running. Always take your finger off the trigger, and shut down the power. Before you put the battery into the charger, make sure it isn’t too hot. A hot battery will take longer to charge, and might even blow up. Batteries tend to get heated when the motor draws more current, i.e. when you are doing some real heavy duty cutting. Don’t push your cordless chainsaw too hard, or else you might end up burning the motor/ battery. Most good cordless chainsaws will have an overload protection system that kicks in whenever the battery or motor is getting too hot, or when the system detects an abnormally high amount of current in the circuit. It should automatically stop the chainsaw, and will inform you that the motor is under high stress. Remember to clean the hard to reach areas of your cordless chainsaw with a can of compressed air, since it will blow out all the sawdust, dirt, grass, etc. that is accumulated within the bar and chainsaw housing. Before starting the chainsaw, check if the automatic oiler is working. To do this, put the chainsaw on a stable platform and place a sheet of paper about 1-2 inches underneath the bar and chain. Give the chain a couple of spins, and you should be able to see a fine spray pattern of oil on the paper. If you can’t see any oil on the paper, or if there is a massive splash of oil along the way, it means something is wrong with the oiler. Sharpen the chain at regular intervals. A dull chain is easy to detect – not only will it cut slower, but the sawdust that is generated will be extremely fine. A sharp chain will create tiny chips of wood, and a dull chain will throw out a very fine cloud of sawdust. You can sharpen the chain manually, or purchase one of many automatic saw chain sharpening tools available in the market.